I was looking at a picture of one for sale in Dubuque Iowa and it looks like the decks on the snappers dont have the roller bars on them. Looks like they just have wheels on the corners of the decks. Is this true? From everything I have seen it is true. Even their legacy model with a 60" deck does not have rollers, looks like it just has a couple of gauge wheels. The funny thing is the list prices of the Snappers appear to be higher than the Simplicitys. The local dealership is selling the Snappers less than the Simplicities. He now kepps just 1 Snapper in stock just to show how much better the Simplicity deck is (deeper/heavier etc.) and encourages the Sim over the Snapper. I think Briggs goal is to keep Simplicity as the high end line. 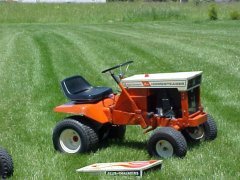 The Snapper tractors are good, they just don't cut as nice as the Simplicity due to no full-width rear rollers on the mower decks.